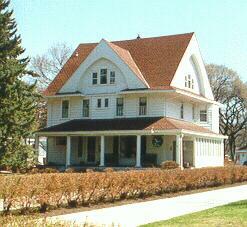 Reeves Drive is the site of many of Grand Forks most historic homes. It is located on the west bank of the Red River. Construction of a dike would affect many historic homes, including those pictured here. Several options are being explored to save at least some of these homes. Some houses could be moved forward on the lots, leaving more room for a dike or floodwall. Building a floodwall instead of a dike would save some homes, since a floodwall would require less land. Methods of stabilizing the soil along the riverbank are being investigated. Stabilizing the soil would allow a floodwall to be built behind these houses closer to the riverbank, possibly saving all the Reeves Drive homes. In March, 2000, the Corps of Engineers released the final dike alignment, which saves all the Reeves Drive homes. Soil stabilization techniques will be used to build a floodwall behind the homes. If you would like to help preserve historic homes in Grand Forks, contact the Grand Forks Historic Preservation Commission, 255 N. 4th St., Grand Forks ND 58203, (701) 772-8756. W.H. 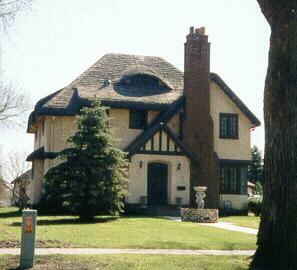 Pringle House, built 1901 from mail-order plans by Minneapolis architect W.J. Kieth. 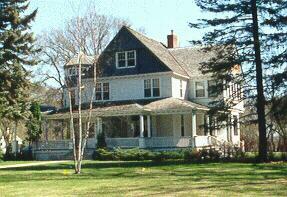 Later home to two Grand Forks mayors, George Duis and Nelson Youngs. 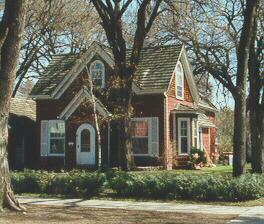 Now the 511 Reeves Bed and Breakfast (701) 775-3585. 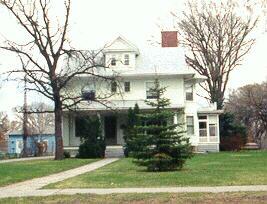 Oliver S. Hanson home, 525 Reeves. Hanson was president of the Scandinavian American Bank, and organized the Grand Forks Street Railway Co. in 1908. William J. Anderson home, 613 Reeves, built 1890. Anderson was mayor of Grand Forks 1894-1896. Later home of Danish Consul Marinus Rasmussen. F.S. Sargent home, 625 Reeves, built 1905. Sargent was a financier from New Hampshire. The home has maple floors and oak woodwork. Cotswold Cottage style home, 717 Reeves. This house is built in an English cottage design and has a mock thatched roof. This page maintained by Alan Draves. All photos by Alan Draves.